Scamp was out at a Gems gig this afternoon, so I had time to do as I pleased. As usual with a free afternoon, I did what I usually do and frittered most of it away. I’d intended doing a bit more painting, but I didn’t. I was going to read a bit more in my most recent book, a true story about a forensic pathologist, but I didn’t. I did sit at the computer for a while, but ended up not doing anything constructive or creative. Eventually got out and bought a rhubarb plant because the old one looks as if it’s dead. I think we’ve had it for a few years now and it’s been producing some stalks every year, but even after a mild winter it’s not waking up for spring. Bought another one anyway. You can’t have too many rhubarb plants. Got some Calabrese which is Italian or Green sprouting broccoli. Too early to plant it out yet (it was only 4ºc this morning) but it can harden off in the little greenhouse. Took the cameras for a walk in St Mo’s and got today’s PoD of a coot sitting on its nest in the pond. 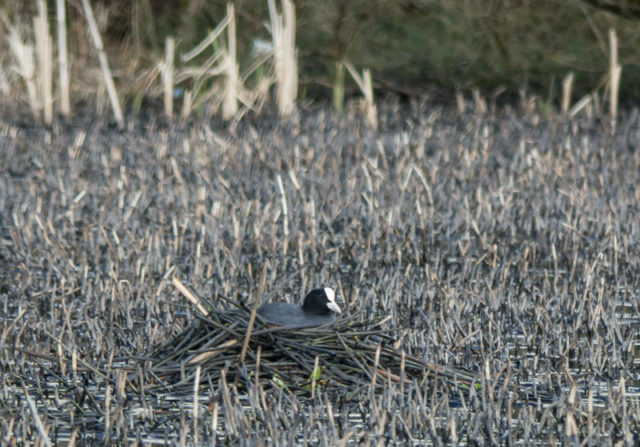 The coot makes the nest in exactly the same place every year. Literally a creature of habit. I also got a ‘fun’ shot of half a bottle of cola of indeterminate vintage. Called the photo ‘Ginger’, remembering the Robbie Coltrane video of the same name. Watched part 1 of Tutti Frutti last night and that must have been what put it into my head. Tomorrow I might have an hour free in the morning because Scamp has the dentist. Don’t have plans for the rest of the day, but next week I must take Hazy’s advice and get my new home for my blog sorted out.